Please scroll down and have a look through at our past brides weddings and what flowers they selected for their special day. Brooke carried a lovely posy of champagne roses with a splash of chincherinchees. Brooke and Joe had a lovely intimate ceremony at the Angaston Union Chapel, so we used small pewter pails with country style sprays in them to compliment the chapel. 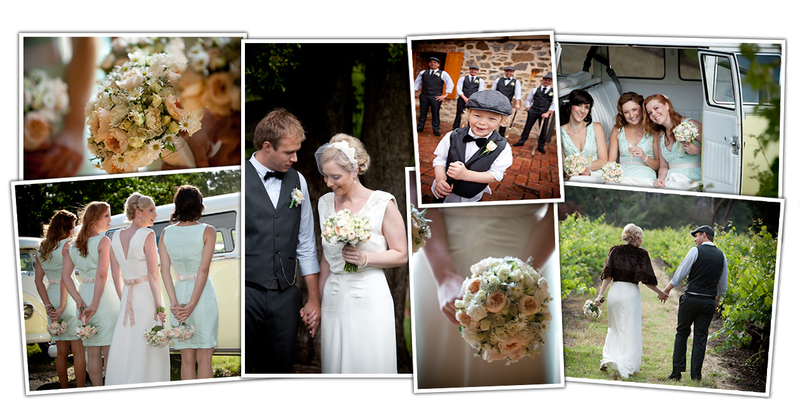 Photography by Lion and Blue Photography, Hahndorf. Amber and her bridesmaids carried beautiful posies of mauve freesias with pink and ivory David Austin roses and viburnum in flower. Edwina and Tom had a lovely ceremony on Edwina’s family farm. She carried a natural style bouquet of champagne roses and we added blue hyacinth to the bridesmaids to compliment their dresses and keep in theme of the country feel to the day. The reception was held at Saltrams, we used the roses and hyacinth as posies in small glass cubes for a low effect on the long tables in the Grey Room. With the tea lights lit it really came to life and looked stunning. Jess and Ben were married in the garden at Langmeil Wines. We scattered a fresh path of autumn leaves for her grand entrance (refer to ceremony pictures). Jess carried an autumnal toned bouquet of champagne roses with orange vanda orchids, maroon calla lillies and white freesias with an ivy base and berries. We used the same selection of blooms for a cluster style arrangement on the tables at Seppeltsfield. James Field Photography. 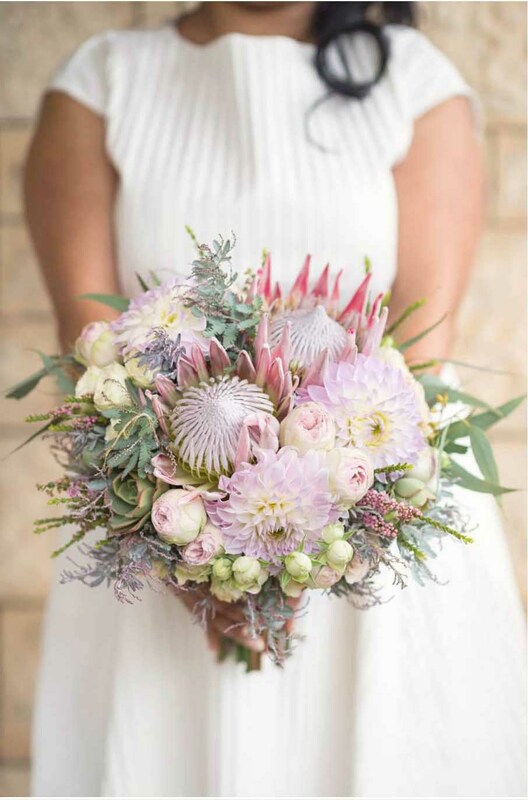 Kate and Corey had us install a stunning collection of posies down one large central table in the Long Room at Chateau Tanunda (refer to styling). The whole theme of the day was country classic with a twist. The floral mix with orange daisy’s, tangerine snapdragons, freesias and alstromeria with geranium in retro vases really gave us that tweak. Kate had a swatch of original coral orange fabric, so she cut it up into strips and used it as napkin ties. We used a combination of the best seasonal flowers available. Yellow Box photography. 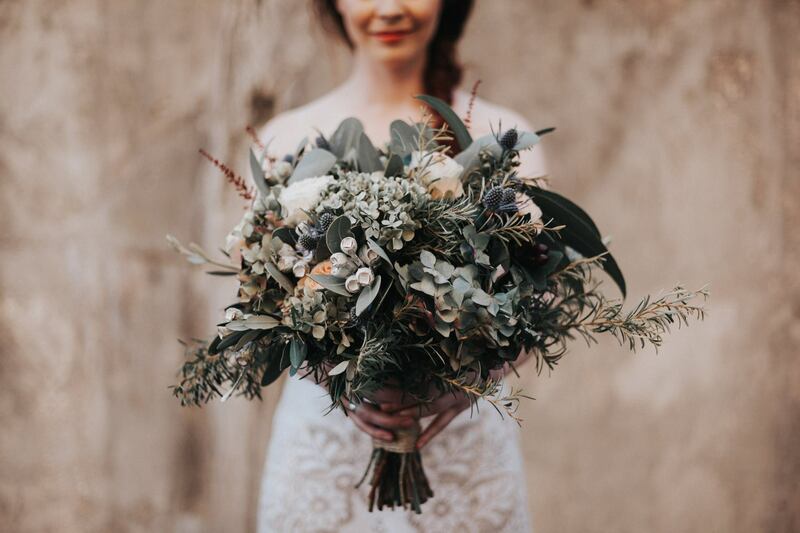 Kendall allowed us to style her bouquet and ceremony arbor with seasonal blooms. They were after a rockabilly style for the day and were open to bright colours. We used two-toned red and yellow tulips, strawberry flowers, pumpkin and red vanda orchids, and hawthorn berries. Narelle and Harley were married at Grand Cru Estate. 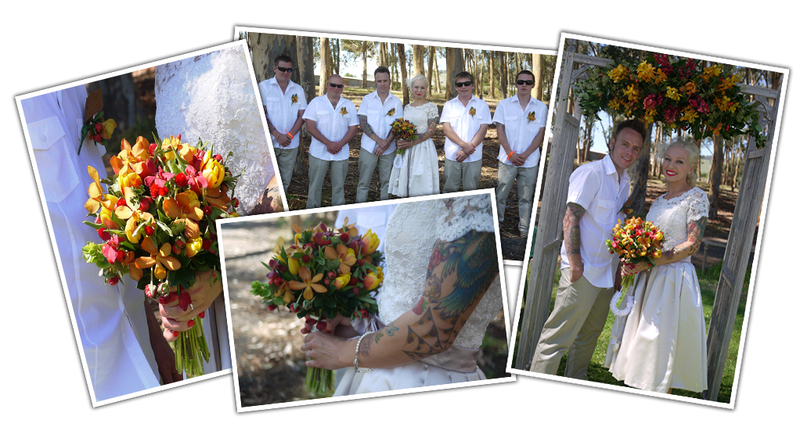 Narelle let us style her bouquets but the criteria was that they must have anthiriums and be something a bit different. So we blended the green anthiriums with green daisy chryssies and molucca balm. We added maroon vanda orchids, orange freesias, maroon leucadendrons and cordyline leaves. 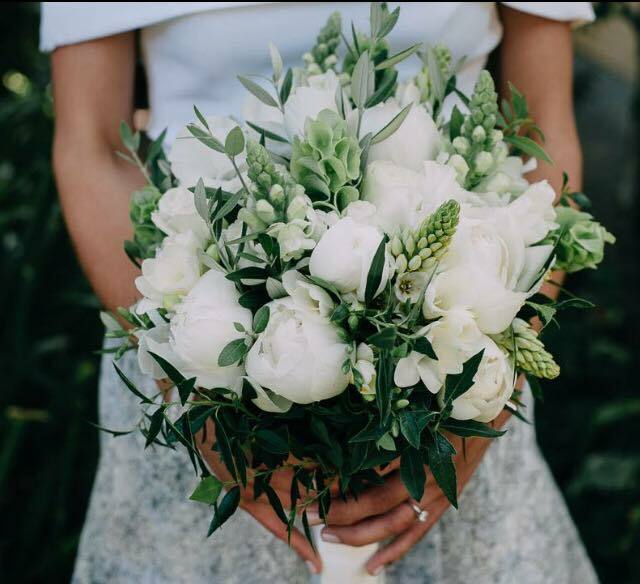 White singapore orchids were used in Narelle’s bouquet to help compliment her white dress. Kerin Burford Photography. Rebecca and Sunny wanted an Indian feel to their flowers but for them to still suit Saltrams. We didn’t go overboard with colour but felt the combination of the flowers was perfect. The girls carried white and maroon tulips with molucca balm, sea holly, purple and white freesias. For Rebecca’s bouquet we hand wired in some vintage beading that her sister and mother had both carried in their bouquets on their own wedding days. It was a lovely personal touch. Photography by Graham Eariss. Rowena carried a peony rose bouquet while her bridesmaids and flower girl carried small posy style bouquet of fresh pale yellow field roses. 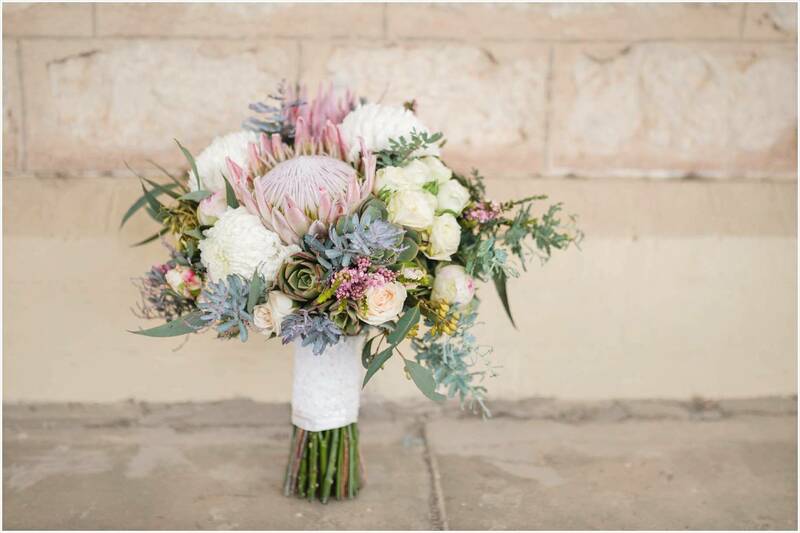 It was a stunning country style wedding at Langmeil Wines where we placed large round posies of these blooms and blue gum on the tables. Photography by Karen Waller. Sarah and her bridesmaids carried stunning country style bouquets of light pink and cream David Austin roses with easter daisys and dusty miller foliage. The styling of the day was loosly based around the pale blue bridesmaids dresses and the sorbet lemon combi vans. This wedding was so much fun to help Sarah bring to life. Photography by Barossa Photo Company. 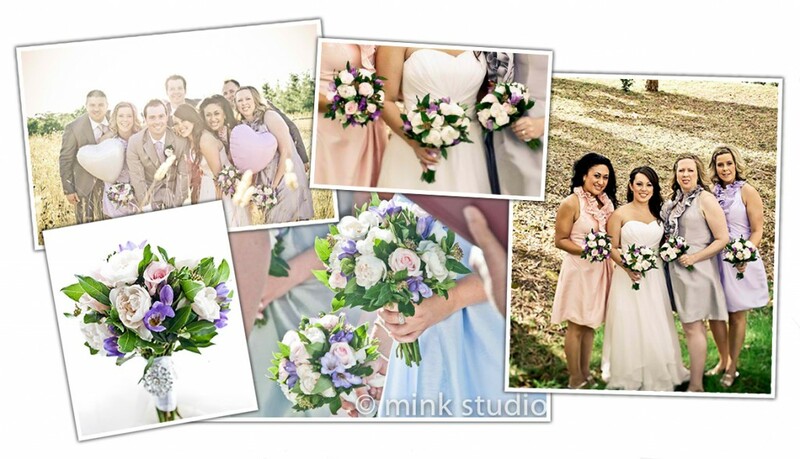 Tanya carried a slight teardrop style bouquet of white lisianthus and trailing tuber roses. The bridesmaids carried posy style bouquets of white lisianthus with unripe raspberries and a dodda vine trim. The reception was at Mt Lofty House where we scattered petals on all the table with candles for a classic and romantic feel. Glen Hawke Photography. Teya and Simon were married at Grand Cru Estate where we scattered a fresh rose petal path and arranged preserve jars of flowers on barrels for a relaxed country feel. Teya carried a posy style bouquet of pink and cream David Austin roses with white lisianthus and white freesias with matching hair flowers. Trish and her bridesmaids carried posy style bouquets of purple lisianthus, hyacinth, light purple freesias and calla lillies with an ivy trim. Vanessa allowed us to style her bridal bouquet. We used maroon and white variegated calla lillies, sea holly, white singapore orchids and an ivy trim with a hint of dodda vine. Vanessa and Kym wanted the dining area at Vintners to feel like it was their special space for the night. After all, it is where you get to see everyone and kick back a little! Vanessa managed to get a hold of some old family wedding portraits and had them framed. We decided to make it a cosy and welcoming spot for family to stand and reminisce over their own wedding days. Together with the hurricane lanterns on top of the wine shelving and the rustic but romantic tables, we knew we were onto a good thing!